Well I'll have to settle for cards featuring beach scenes for now. Cards! I've missed spending some time making cards and last night I finally had some free time to just create...just for fun. 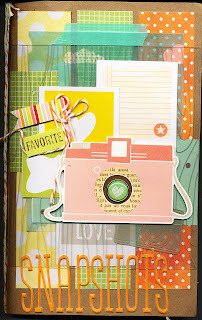 Sweet 'n Sassy is featuring today's sketch challenge on Splitcoast and I just loved the sketch...Hello? Banners? Why yes, I'd love to play along! I'm in love with banners lately! I grabbed some summery feeling paper from My Minds Eye and my Ocean Paradise stamp from Sweet 'n Sassy and got crafty! I started by cutting all of my cardstock. This is what I love about sketches; I can cut all of the cardstock and have it ready to assemble when I'm finished with the main image panel...perfect! I then stamped my beach scene, using black Memento Ink, and then grabbed my Distress Markers...'cause summer just seems to go with watercoloring, right? To color the image, I first scribbled with my markers onto a non-stick craft sheet and then used a watercolor brush to pick up the color and apply it to the image. This is my preferred watercolor method when using the markers as I feel like they don't bleed enough when you apply the color first to the paper and then try to blend with the brush. Then I assembled and added a few tiny gold pearls...Easy peasy and oh so beachy! Hi friends and welcome to my sorely neglected blog...Seriously, I need more crafty time in my life! Well...this past weekend, I took advantage of some extra free time that I did have and decided to put together a darling mini album kit, the Snapshot eKit, which was created by Mary-Ann Maldonado, and offered by eclectic Paperie. Oh, I created a little video on the process of putting together this album. It's a great way to see all of the goodies included in the kit! I am a huge fan of mini albums, especially onces that I don't have to create from scratch! I love kits because you get everything needed to create the mini album and you get full directions. Only assembling is required...Oh yeah, talk about finishing a complete album in just about two hours! Love that! This kit contains an album, in the Smash book style, from Amy Tangerine. And this is the cutest album I have ever seen! Seriously, so cute...The album is filled with pages of every size and style. Vellum type pages, tickets, scallop pages...I was giddy once I opened the album and checked out all the goodness inside. Mary-Ann even includes items like toothpicks in her kits...So you can make your own banners, of course! All you need to finish the albums is a paper cutter, adhesive, and foam tape! Easy peasy! And for this album, I found photos from 2008 that have just been collecting dust in my studio. These photos are from a trip our family took to NY....my kiddies were so little and it was so much fun to go through this photos again and finally get them into an album! Seriously, look at those smoochie faces! Ugh...they grow up too fast!! This album even has an envelope stitiched into the center...perfect for keeping track of little mementos. And I love the map paper...isn't that great for vacation photos? Looking for a way to create a quick and easy mini album? Check out all of our eKits, dust off those photos, and get them into an album! And save 10% on all our eKits, from now until 1/29, just use code KIT10 when checking out! Last week Korin was on a clean and simple design kick and was posting the most precious cards to her Facebook page....that inspired me to pull out my well loved Sweet 'n Sassy stamps and create my own CAS card! And since a big snowstorm was predicted for last night (we got nothin'! ), I was thinking of the cold and winter so I grabbed one of my fav sets, Snowflake Silhouettes. Now someone get me either a decent snowstorm or warmer weather!! 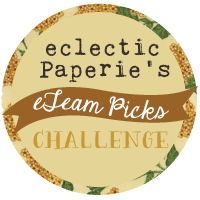 Hi everyone and welcome to eclectic Paperie's first eTeam Picks challenge! The eTeam Picks challenge is all about having fun! On the third Thursday of every month one of the eTeam members will throw out a challenge. Those who want to participate in the challenge can enter their project and be entered into a drawing for a $15.00 shopping gift certiciate to eP! Visit the eP Blog for all of the details! This month's challenge was to alter a box...any kind of box...wait until you see what Marjie came up with...fun stuff! I decided to alter a 3x3 mini box and followed Donna-Marie's tutorial to create my project. I started by painting the edges of the box with Pitch Black acrylic paint. I then used paper from the Authentique Renew line to cover all the sides of the box (love the new 8x8 paper pad size!). This box comes with a lid but I followed Donna-Marie's directions for keeping the lid upright. Since I get a little sneak peek at the upcoming paper lines (one bonus of being a store owner!! ), I had some die cut pieces in my stash and used one of them to decorate the front of my box. I then layered the Poppy Patch die over the die cut (doesn't that look great in the black grid paper??) Added a butterfly (Martha) and sentiment, from Sweet 'n Sassy. The inside of my box holds six chipboard tags. I decorated each tag with black cardstock and then created pockets by cutting a piece of designer paper in half, diagonally. I decorated each tag with more fun die cuts, rhinestone swirls, buttons, and more butterflies. Inside each pocket I created a tag with one of the many sentiments in my stash from Tim...I love his sentiment stamps! I first lightly stamped this worn background on the white and then added the sentiment in black. The top of each tag got a little tab (a SU! punch), which held a butterfly or button. This was a great project, super easy and fun, and I'm so excited to have my box of creative phrases sitting on my desk! So...what will you alter? You have two weeks to submit a project....Go get busy, visit us on the eP blog, and share your creation! Can't wait to see your work! Hi everyone and welcome to our last sneak peek release day for Sweet 'n Sassy! Have you been having an amzing time on each day's hops? I have loved seeing all of the creations by our super talented design team! Be sure to check the SNSS blog for all of the release and hop details! I created each Valentine with the same design and simply changed out the animal and sentiment. I started by stamping the Friendship Script background stamp on kraft cardstock (oh, these are all ATC size, 2.5" x 3.5"). I then die cut a heart, using the Hearts die set, and ran it through an embossing folder. Next the fussy-cut critter was colored with Copics and attached to the heart, using foam tape, and the sentiment was added! Perfect size for my young children and enough room on the back for me to write a little note to each of them...I can't wait for February 14! I hope you enjoyed today's post and enjoy the hop! We're back for day four of the Sweet 'n Sassy release week celebration!! Are you having the greatest time?! Oh my, I love seeing the new sets each day...so much crafty goodness!! Be sure to check out all of the release details on the SNSS blog before starting on your mini blog hop journey! As you can tell by my numerous cards for today's post...I love this heart set! I love even more that there is a coordinating die set!! I couldn't even stop creating once I opened the Bottom of My Heart stamps...the different heart sizes, the patterns...what's not to love! For my first card, I decided to combine my new love of stencils with my ongoing love of stamps. I started by using the Mini Splats stencil and Black Soot Distress Ink to create my faux ink splat...isn't that fun! Then I embossed one of the hearts, using white embossing powder on black cardstock. Cut out the heart and added the sentiment..in red...love the white, black, and red color combo. My last card gets a bit more girly and combines fun colors and textures. I used the XO stamp to create a bakcground in Spun Sugar Distress Ink and then layered three hearts. Just needed to add a sentiment and add the panel to a card base. Wasn't that a fun set! Now head on over to the Sweet 'n Sassy store to place your order for the set and die! Welcome to the next day of the Sweet 'n Sassy release week celebration! Today we're showcasing the brand new Long Stem Silhouettes. I am a huge fan of silhouette images so I was super excited to receive this new set in the mail (and I've already found a million other uses for the wonderful sentiments!) I loved this set so much, I made two cards for the release! Yippee!! Be sure to check by the Sweet 'n Sassy blog to get all of the details on the releases and prizes! For my first card, I decided to have a little fun with my Dylusions Ink Sprays. I wanted to create a bit of a sunset background without using my traditional Distress Ink and blending tool. I simply spritzed Squeezed Orange, Fresh Lime, and just a hint of Vibrant Turquoise onto a piece of cardstock, hit the ink with a heat gun to quickly dry, and stamped the image in black right on top of the ink. A sentiment was all that was needed to finish this CAS card. Love that bright lime color! My second card features more of the images included in the set and I started by stamping the first image in white, the second in Walnut Stain, and the third in black. I love this color combo on kraft cardstock. I simply added a tiny butterfly (Martha Stewart punch) to finish the card. The card background? Well that's paper from the Echo Park Documented paper pad, and this was a card base I created months ago. I never finished the card and when I finished the main image of today's card I realized it fit perfectly on the base! Hey...never throw out that cardstock that never quite makes it into a card! It's our first eclectic Paperie Get Altered Challenge!! So exciting...here's a sneak peek at my project, you can find all of the details on the eP blog...Come play along and be entered into a drawing for a shopping gift certificate!! Hi there and welcome to my second post of 2013! I'm off to a good start! **smile** I had some time to play along with Tim's January tag challenge yesterday and I thought I'd share my creation with you today! I missed doing the tags at Christmas this year so I was itching to make a card. My goals, any time I participate in one of Tim's tag challenges, is to incorporate the elements he used on his tag and to use some or all of the same techniques but not to copy the same design. This month's tag included embossing, Distress Ink, metal accents, a big 'ol sentiment, film tape, and some great layering. My first step was to use an embossing folder to emboss a tag. I liked this circle design and it was similar to Tim's gears embossing folder that he used on his tag so...I went with it! Next I used Wild Honey, Tumbled Glass, Mustard Seed, and Walnut Stain Distress Ink to color the tag. Then I spritzed with Perfect Pearls because I love that tiny bit of shimmer! 1 - Added the film strip to the left side of my tag. Use thin red line tape to attach the film. 3 - Stamp the mini ticket on cream cardstock, cut it out, and age edges with Walnut Stain. 4 - Cut two dress forms from grunge paper. Color one with Shabby Shutters Distress Ink and stamp over the top half with a script stamp. Color the stand with Walnut Stain. 5 - Use paper from October Afternoon (Farm Girl) to create a skirt. 6 - Wrap washi tape around the waist (for a belt) and use a glue gun to attach a metal flower. 7 - Stamp music notes on crinkle ribbon and color with Tumbled Glass Distress Stain. Now it's time to assemble! I used a glue gun to attach the metal leaves on the shoulder of the dress form. Then I added the dress and used the mini ticket to note the month and year I made the tag. Use a glue gun to attach a mini pin to the top of my sentiment and then use foam tape to attach sentiment to tag. Use foam tape to attach this sweet clock from Wendy Vecchi's Blossom Bucket collection. Happy New Year! After taking a week long hiatus from blogging I'm back to a regular schedule this week. During the holidays, I had a great opportunity to spend a lot of time crafting and I'm excited to share my projects over the next few weeks. Later this week, Sweet 'n Sassy will begin sneak peeks for the January release. Lots of great stamp sets this release, can't wait! 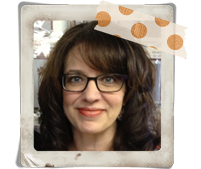 And this Thursday, January 3, I'd be sharing a challenge project on the eclectic Paperie blog. We are announcing two new monthly challenges this year and I can't wait to see what everyone creates! Be sure to check the eP blog on Thursday for all of the details! As for today's card, I've had the brand new Poppy Patch D'Lites sitting on my desk for weeks and I finally broke it out of the package last week. I kept it all white (love this style) and very clean and simple...isn't this fun? 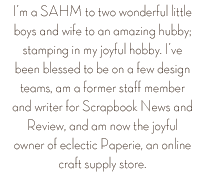 And that sentiment...a tiny sneak peek of the upcoming Sweet 'n Sassy release. Enjoy and be sure to check out all of the D'Lites in the eP store...specials on all Spellbinders dies...all day, every day!